Steven Covey says, “The main thing is to keep the main thing the main thing.” That’s what we say about Project Based Learning: make projects the main thing. Don’t fall into the trap of using a little PBL here and there. Students who engage regularly in well-designed projects retain knowledge better, learn more deeply with understanding, and develop skills to be successful in college, career and life. We have seen firsthand the transformation that happens for students, teachers, and communities when teachers keep PBL the main thing. Too often, projects are not the main thing because teachers need the time and support to make shifts in their practice from more traditional approaches. They may have assigned “projects” before, but have trouble seeing how they can teach more of their curriculum via PBL. How can teachers make projects the main thing in their classrooms? 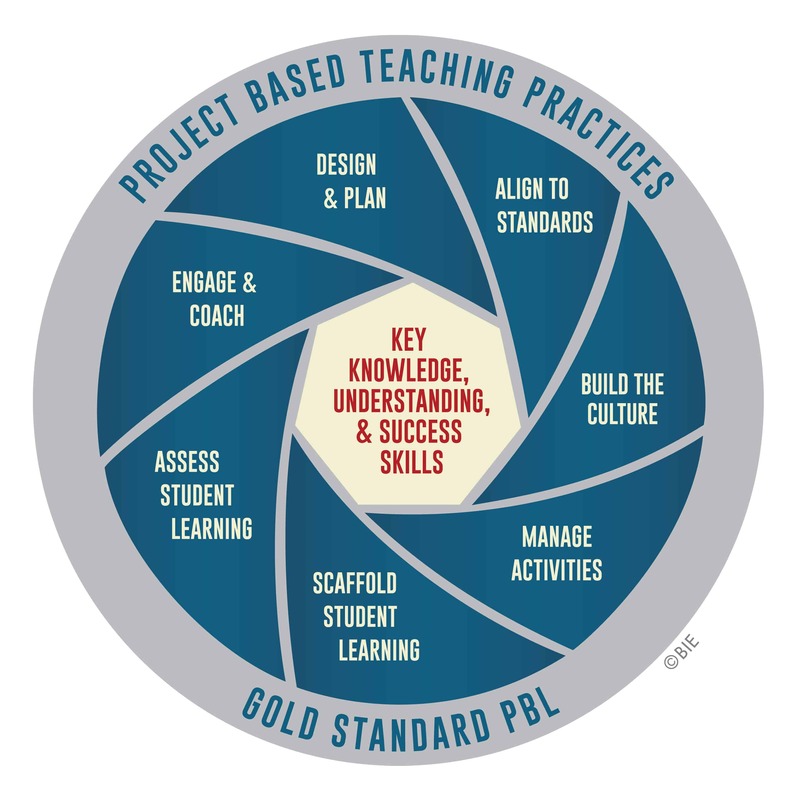 To support good Project Based Learning (PBL), the Buck Institute for Education (BIE) recently created a model of Gold Standard Project Based Teaching Practices. These seven practices describe what teachers need to know and be able to do to make projects the “main thing” in their classroom. Teachers can use a variety of tech tools to translate each of the following Gold Standard Teaching Practices into rich and rigorous projects. Teachers create or adapt a project for their context and students, and plan its implementation from launch to culmination. Coming up with new projects is not always easy, especially for teachers new to PBL. The Global SchoolNet’s Online Registry offers 3,000 annotated projects, which are searchable by date, age level, geographic location, collaboration type, technology tools or keyword, and created by educators and youth from around the world. NextLesson also offers Common Core aligned projects and performance tasks for K-12 students in math, science, social studies, and English language arts. BIE’s website has project planning forms as well as an online project planner. Teachers use standards to plan the project and make sure it addresses key knowledge, understanding, and success skills. Aligning projects to standards and key concepts and skills is an essential PBL teaching practice to ensure rigor. Teachers can access project-based courses aligned to the Common Core Standards and Next Generation Science Standards for students in grades 9-12 on Educurious. On this site, students also have access to project and career experts who provide expertise and real-world feedback. Google Forms is a great tool for teachers to create quick surveys for students to share feedback on lessons, voice their opinion, and offer ideas about projects. Teachers can administer free annual surveys to collect valuable information directly from students, using Tripod’s Student Surveys of the 7Cs: Care, Confer, Captivate, Clarify, Consolidate, Challenge, and Classroom Management. Gallup also offers the Gallup Student Poll, a free annual student survey that measures Hope, Engagement, Entrepreneurial Aspiration, and Career/Financial Literacy for schools and districts to administer in grades 5-12. Teachers work with students to organize tasks, set checkpoints and deadlines, find and use resources, and create products. 8. Projects have many pieces that need to be organized from start to finish. Teachers can use Project Foundry, a web-based platform, to manage projects and to help students manage, archive, and showcase projects. Using Google Docs, teachers can use Google’s online Docs, Sheets, and Slides to create and archive projects, project activities, student work, and much more. Google Docs is the ultimate sharing and collaboration tool. Microsoft Office Online offers many templates, which can be used as is or customized. Teachers can use choose from a variety of Planners and Trackers to set up and monitor their projects. Teachers can help students and parents stay on track during a project using Remind. Using this web-based tool, teachers can send messages to individuals and groups about project updates and deadlines using instant messaging with photo and document sharing features. Teachers engage in learning and creating alongside students, and identify when they need skill-building, redirection, and encouragement. Teachers who practice Gold Standard PBL coach students to success. The basis of their coaching comes from an understanding of each student’s strengths, weakness, and interests. NextLesson’s InterestID makes it easy for teachers find out what interests students. K-12 students can share their likes and dislikes for interests in over 30 categories, ranging from careers to amusement parks. Teachers can determine student interests as a class and find interest-aligned projects in NextLesson’s bank of projects. In PBL, teachers carefully move students progressively toward deeper understanding of the content and greater independence in their learning. Newsela has hundreds of news articles and non-fiction literacy texts at five different reading levels for students in grades 2-12. Students can annotate and highlight articles and take Common Core aligned quizzes. Teachers can use Screencast-O-Matic to provide oral feedback on students’ writing or work products, which is a great way to support English Learners, students with disabilities, and struggling readers. Edmodo’s Snapshot is a database of over 15,000 Common Core aligned questions that teachers can access and use as checkpoints throughout a project. Biz Movie is a fun and engaging way to assess student learning in a project. Students in grades 3-6 show what they know and can do by creating animated movies. Students also learn the basics of entrepreneurship and business as they create and run movie companies. What tech tools do you use in your classroom to make projects the main thing? What Gold Standard Project Based Teaching Practices are they aligned to? What do you like about them? Share with us on Twitter using the hashtags #PBL and #PBLWorld. Sally Kingston is a Senior Education Analyst at AEM Corporation. Follow Sally on Twitter, @SallyKingston5. Bob Lenz is Executive Director at Buck Institute for Education. Follow Bob on Twitter @PBLBob. Pbl diesnt and should hinge on tech. As a software developer that’s a strange thing for me to say but as a teacher I can tell you that I have been to s9ftware teams out there working fir large industries with team facilitators that have been working with tech longer than I’ve been teaching and many of them steer clear of using too much tech but successfully apply project based solutions regularly and successful. The technique they use is called Scrum created and perfected by Jeff a Sutherland (Check out his Ted Talk) which shows teams of individuals how to support each other and expand each persons contribution to the successful outcome of a project. There are tech options that can be used but as teams out there change with different projects the amount of time spent yraining them up to use the favourite tech for each team is time prohibitive. T8me is one after all. As a qualified Scrummaster and a qualified teacher The classroom techniques I had discovered mapped so closely to Scrum that I decided to create an intermediary stage which worked so well I wrote a book on it called Scrum in schools. The impact this made on my classes just made me more passionate about brining Scrum into Secondary education that I developed more projects and wrote another book detailing 3 more projects. Graduate software developers that I have exposed this intermediary Scrum style to were so exciting at the results that the teams were taking pictures of their groups by the end if the session where before they had never even met each other. I know tech is highlighted as important in schools now but don’t get hung up on it. It’s the pbl skills of coordination control organising, and other soft skills that pull a team together and engage each other to thrust towards a solution not tech. There pbl 8n schools the better for our industries that spend fortunes on training that schools can provide right now. For software developers or any other team orientated career. Thanks so much for reading and posting. Appreciate your comments! Love your combined experience in tech and teaching. Apologies for the typos! No edit option and using tiny mobile screen!! Thanks Peter. Really appreciate this and the link to your work. Nice! Hi there, thanks for the comprehensive list of resources. I have used Post Its ( both the paper version and the iPad app) for team brainstorming, then Google Drive for pretty much everything else. A collaborative Google Sheet is an invaluable online repository for ideas and knowledge found through team research. There is also a great sense of rapid progress as the students watch the spreadsheet fill up with info as they work, so it’s motivational as well as providing a tangible (long term) record of individual and group effort and discovery. Google Forms are also excellent for student feedback, Screencastomatic is free, easy to use and excellent to build Khan Academy-esque tutorials for absent students or even for interested colleagues or school leaders.